Christian Slater, Patricia Arquette, Dennis Hopper, Christopher Walken. Brad Pitt, Val Kilmer, Gary Oldman. Size: 27 x 40 inches (68.58 cm x 101.60 cm). Condition: near mint-mint and unused. 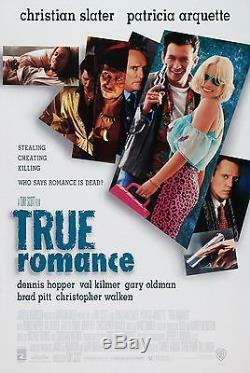 The item "TRUE ROMANCE (1993) ORIGINAL MOVIE POSTER ROLLED DOUBLE-SIDED" is in sale since Friday, April 21, 2017. This item is in the category "Entertainment Memorabilia\Movie Memorabilia\Posters\Originals-United States\1990-99". The seller is "moviepostercenter" and is located in California.